Acapulco may not be the Hollywood celebrity magnet it once was, but with its glorious beaches, jumping main drag and pulsating night life, this holiday resort still packs a punch. If the city has an iconic signature, it's the La Quebrada cliff divers, who thrill onlookers today just as they did decades ago when jetsetters like Frank Sinatra, John Wayne, Rita Hayworth and David Niven helped put Acapulco on the map. With a population of 1.6 million people, Acapulco has been relentlessly developed, and there is little hint of its early origins. Longtime visitors may grumble that the area has lost its charm, but with its lovely, natural setting, rising from the blue bay up into the Sierra Madre mountains that frame it, Acapulco remains an undeniable scene-stealer. Cruise ships tie up at a pier in Old Acapulco -- just below the Fort of San Diego -- which was built in the 1600's. It's a terrific location; the center of Old Acapulco is a few blocks to the west, and the bay beachfront is just steps away to the east. An interesting factoid: Our ship rolled more at this dock than at almost any other time during our cruise of Mexico's Pacific coast. (It was gentle, though still quite noticeable.) You may not see them, but deep swells and impressive tides are characteristic of this magnificent harbor. The marine terminal, which, overall, is quite unimpressive, has restrooms, a few trinket shops, an Internet station and kiosks offering guided tours. Basically, it's a walk-through. With Mexican drug crime a staple in the news today, it's no wonder that security is a cause for concern. 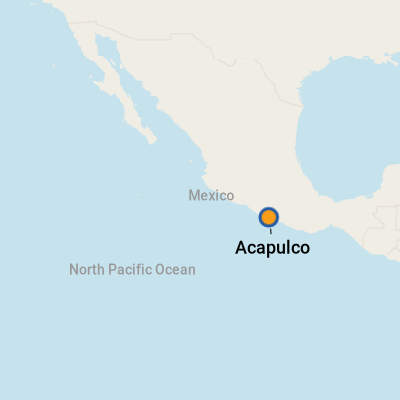 What most foreign visitors don't realize, until they sample a place like Acapulco for themselves, is that tourist districts are under heavy guard -- and have been for years. Armed police are a huge (and, frankly, comforting) presence on the street, at the pier and in patrol boats that stand sentry over cruise ships while they are in port. That's not to say you shouldn't take the same precautions you would in any other city: don't wear flashy jewelry or watches or carry excessive amounts of cash, and steer clear of deserted beaches or streets after dark. The best thing about the cruise ship pier is that you can soak up a lot of scenery on foot. The fort, the old town and the beaches along Costera Miguel Aleman are all walkable -- 15 minutes at most. But, there's still a lot that is not -- the site of the cliff divers; the gorgeous hotels and beaches in the Diamante, or Diamond, district; and the far reaches of the bay are among those that are not stroll-worthy. The good news is that there's a public bus that runs the length of the strip for just a few dollars. And taxis, many of them Volkswagen Beetles, are everywhere -- and they are pretty affordable. A ride from downtown to a Diamante hotel should cost $15 to $20. Tip: Establish the price first. There are a number of so-called "authorized" taxi vendors at the marine terminal, but their prices tend to be higher than those you could negotiate by hailing a cab yourself. Also worth considering: You can hire a private, air-conditioned SUV for six people with an English-speaking guide for $60 -- $10 per person, per hour -- at the marine terminal. Mexico's currency is the peso. Visit XE.com for current rates. ATM's are plentiful and tend to be the cheapest way to acquire pesos. However, most taxis and vendors will accept U.S. dollars or euros, and guides are happy to be tipped that way. Credit cards are not generally accepted in small family restaurants or tiny shops. To be on the safe side, ask first. Spanish. Surprisingly, little English is spoken, except in the finer hotels, restaurants and shops in the tourist district. Many eateries do, however, have English translations on the menu. , especially American outposts, which include Burger King, McDonald's, KFC and Starbucks. On the plaza in Old Acapulco, La Flor de Acapulco has been offering basic fare since 1939. A local's favorite, the second-story, open-air restaurant is a terrific spot to people-watch while sampling the catch of the day or other popular items like tacos or enchiladas. Lunch costs about $10. No credit cards are accepted -- cash only. Spend any time on Costera Miguel Aleman, and you can't help but notice 100% Natural, a good-looking eatery that features light, healthy foods. It's popular with residents and tourists alike, and there's a beach location on the strip, just east of the cruise ship pier. Credit cards are accepted. As for the Diamante, many of the hotels have fine restaurants. There is no lack of artesano markets that sell embroidered textiles, hand-painted ceramic plates, masks of the region, wooden carvings and silver from Taxco, one of the world's silver capitals. To ensure its authenticity, make sure the silver is stamped .925. There are all manner of shops on Avenida Costera Miguel Aleman, the boulevard that hugs the bay. One popular market on the strip is La Diana Mercado de Artesanias. Be prepared to barter; shops, however, have set prices. There are also lots of souvenir shops in Old Acapulco. Sanborns, a chain well-known throughout Mexico, sells souvenirs and a host of other products. There's a store on Costera Miguel Aleman, three blocks west of the marine terminal.